This is our review for Toys R Us Toyologist 2012 that, combined with our application form, led to us being chosen as Toyologists. Unfortunately some of the formatting and images didn't transfer to this version. Hi, I’m Daniel. I’m 6 years old and together with my 8 year old big bro Joshua (here he is giving you a wave!) I’m going to be telling you about our most favourite toy at the moment. 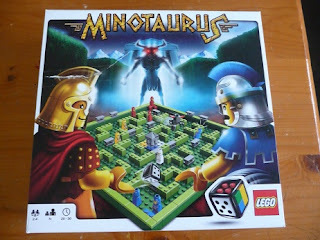 It is a fantastic LEGO game called MINOTAURUS. It is supposed to be for children aged 7 and over, but I love it and I’m only 6 years old. I love it so much because it is fun and exciting. You have to get your team of three LEGO people to the centre of the LEGO labyrinth. Watch out for the Minotaur though. If he gets you, you get sent back to your starting corner! It really is one of those games where you never know who is going to win as it can all change at the last minute. It has a really cool dice where you can change what is one each face to vary how you play the game and that makes it more interesting. 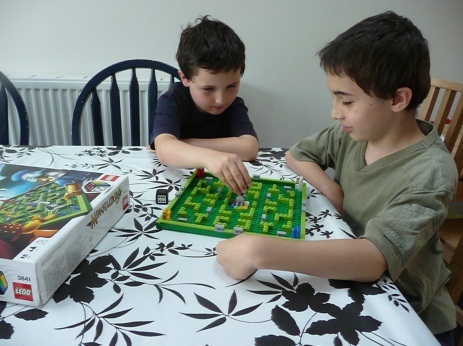 For example, you can put a ‘green’ face on the dice and that allows you to jump over the hedges. The grey side allows you to place a block to stop another player or to block the Minotaur. A black side means that you can move the Minotaur 8 spaces. “At £17.99 from Toys R Us, this LEGO Minotaurus game has proved to be great value as the kids love to play it almost every day. It comes in a sturdy box and made a great present for Daniel’s last birthday. Although it might not look like a lot of LEGO in the box, it actually makes a great game. It was so easy to set up using the step by step instructions included. Once set up, it can then be kept in the box ready for the next time you want to play. My only minor negative would be that the ‘template’ to help set up the labyrinth pieces is made of cardboard and that could wear out and tear over time. However, the instructions show how to set up and you don’t even have to use the labyrinth in that layout so it wouldn’t pose a major problem anyway. We LOVE this game so much! It is a great game and mum says it was worth every penny. We hope you will enjoy it too!